The marshes and wetlands along the Gulf are still covered in crude. And these kind of stories go to the heart of what is wrong with the government’s estimates. The numbers, hard to be prove or disprove serve their interests in a win-win situation. 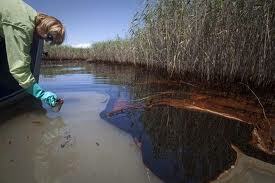 It doesn’t matter how much oil is found in the marshes or out in the open Gulf waters, the government can conveniently point to their statistics and show how they never said all the oil was gone while they also get to maintain their “75% of the oil gone” figures as accurate. But the Gulf of Mexico and everyone who lives there, works there? Next Post FCC Net-Neutrality Meetings Crash to a Halt…Good.